She was flooded with praise for releasing her album critically-acclaimed No Shame in June, after a four-year hiatus. 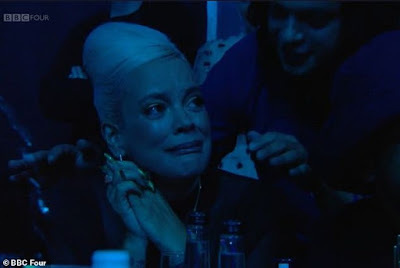 But Lily Allen appeared disheartened as she was pictured sobbing after losing out to alternative rock Wolf Alice at the 2018 Hyundai Mercury Music Prize at London's Eventim Apollo on Thursday evening. Detailing her disappointment, the singer, 33, took to Twitter to claim she was 'robbed' of the award, and insisted she's determined to win the annual prize next year. In the first tweet, the Trigger Bang hitmaker penned: 'Someone call 999 I’ve been robbed', alongside a clip of her performance at the ceremony. Injecting a hint of her trademark humour, she continued: 'Next time......... imma win that b***h.
Hitting the red carpet earlier that evening, the singer oozed sophistication as she slipped into an elaborate semi-sheer dress, embellished with quirky feathers details throughout.